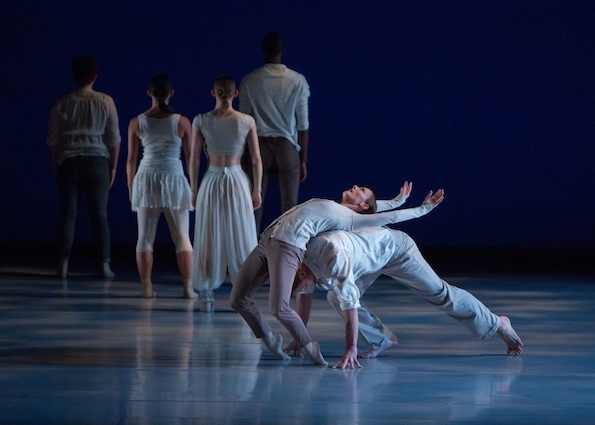 MET Dance is a repertory company, meaning each performance features a wide variety of works by various choreographers, sometimes highlighting up to six choreographers a year. This keeps things interesting for the dancers and audience members. MET Dance is different because it strives to feature emerging and guest choreographers that, like the company itself, are at, or perhaps nearing, national attention. The company was formed in 1995 under the direction of Executive Director Michelle Smith and then Artistic Director Dorrell Martin. The group fell financially and artistically and decided to reorganize in 2003. Current Artistic Director Marlana Doyle was one of four dancers rehired to put the company back together. The diversity and range of the company is what brought Doyle there in the first place. She graduated from Point Park University and moved to Houston in 2001. “I did not want to follow all my fellow graduates to New York and Los Angeles and knew Houston had a great dance scene and is supported by the arts,” she says. 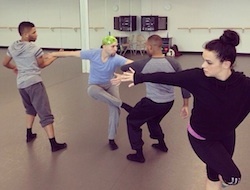 MET dancers with choreographer Joe Celej in rehearsal. Photo courtesy of MET Dance. Even when Doyle was still dancing with MET Dance, she became the Company Liaison in 2003, Company Manager in 2005, Managing Director in 2009 and then transitioned to Artistic Director in 2012. She strives to gain national recognition for the company and to always take chances on choreographers and dancers. To keep up with the ever-changing, unpredictable repertoire, the dancers, too, must be versatile and well-trained. A day for the MET dancers begins with an hour-and-a-half class that changes daily between ballet, jazz, modern, improv, yoga, Gyrotonic or Pilates. Most of the MET dancers have a strong influence in jazz and have all had ballet and modern training, but they are all quite different in their look and style. Yet, even with this range of backgrounds, the company is able to find that balance of dancing as one while still holding on to their individuality. The 2014 season looks to be an exciting one for MET Dance. It will be the company’s first full year in the new Houston Metropolitan Dance Center facility, to which they relocated in May 2013. 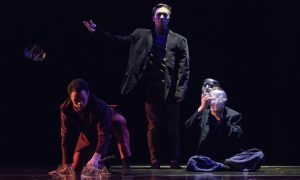 The company most recently presented two works, Peter Chu’s Love Duet and Skarpetowska’s Consumed, at the APAP|NYC Conference in January, when they also held two NYC auditions. MET Dance will also present two premieres by Andrea Shelley and MET Resident Choreographer Kiki Lucas in its spring concert titled #womenfordance, featuring all female choreographers. In the company’s upcoming free summer dance concert to be held at the Miller Outdoor Theater, an emerging choreographer (who is currently being selected from a pool of entries) will premiere a new work, along with Celej’s newest premiere, Primed. For dancers interested in auditioning for MET Dance, Celej recommends attending the company’s professional intensive, which takes place annually in June. 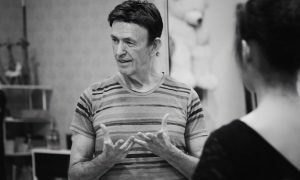 “The intensive allows the directors and company members a chance to work in class and rehearsal settings with dancers interested in working with MET,” says Celej, who is also on the intensive’s faculty each year. With its broad range of artistic voices, both among the group of dancers and the choreographers brought in, MET Dance surely has lots to say. For more information on MET Dance, head to www.houstonmetdance.org. Photo (top): MET Dance in a performance of After the Rain by Lauren Edson. Photo by Ben Doyle. The Harvard Dance Project spring 2018: Dance to make you think – and more!